september 2010 | 290 blz. 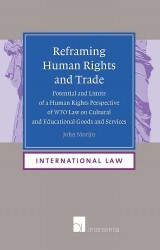 The how and why of connecting international human rights law and WTO law has been a hotly debated topic in international legal scholarship for quite some time. This book explores the extent to which these two sub-regimes of international law can be meaningfully linked as a matter of law and policy. WTO law on cultural and educational goods and services, thus far under-explored in this area of study, is taken as a case study.